The Cadillac Three have released a new single, and it's a celebration of the many and varied joys of beer. Crackin' Cold Ones With The Boys was written by the band along with their road crew, Jefferson Brown, Benjamin Dunn, Chris Grainger and Brandon Wootten. "We had a random studio day where our engineer and I had a few hours before the other guys arrived, and we cut some drum grooves,” says drummer Neil Mason. “Later, Jaren and I pulled them up on the bus while we were in Vegas and he started writing the lyrics. "Our band and crew have this ongoing joke about how it’s time to ‘crack some cold one with the boys’ so we ran with that. The song was finished an hour or two later... so we drank some beers!" The video for Crackin' Cold Ones With The Boys was shot at St. Andrews Hall in Detroit, on the band's Country Fuzz tour. “We spend almost every week out on tour and the interaction that happens from the stage to the floor is the reason we do what we do,” says Mason. “When we thought about what we wanted to do for our video, we decided to take a few cameras out on the road and film the live show because our fans always come to party. "And, that’s everything the song is about!" 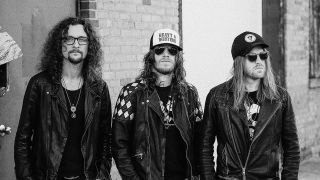 A new album from The Cadillac Three is expected later this year, the follow-up to 2017's Legacy. The band are currently on the Outlaws & Renegades Tour in the US, playing dates alongside the Charlie Daniels Band, Travis Tritt, and the Marshall Tucker Band.